For ither fowk named Paul Walker, see Paul Walker (disambiguation). Paul William Walker IV (September 12, 1973 – November 30, 2013) wis a American actor. He began his career guest-starrin in several televeesion shows such as The Young and the Restless an Touched by an Angel. Walker gained prominence wi breakoot roles in comin-o-age an teen films such as She's All That an Varsity Blues. In 2001, Walker gained internaitional fame for playin Brian O'Conner, ane o the lead protagonists in the street racin action film The Fast and the Furious, an wad reprise the role in its sequels. He wis in films such as Eight Below, Into the Blue, Joy Ride an Takers an aw. Ootside o actin, Walker wis the face o The Coty Prestige fragrance buist Davidoff Cool Water for Men an starred in the National Geographic Channel series, Expedition Great White. He foondit the charity Reach Out Worldwide (ROWW) an aw, a organization providin relief efforts for auries affectit bi natural disasters. Walker dee'd in a single-caur accident on 30 November 2013 alangside friend Roger Rodas. His films Hours an Brick Mansions wur released posthumously an his feenal film Furious 7 wis released on 3 Apryle 2015 in the Unitit States. 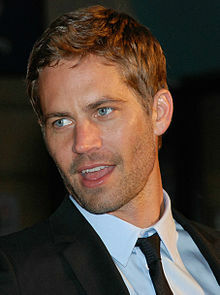 Wikimedia Commons haes media relatit tae Paul Walker. This page wis last eeditit on 14 Apryle 2017, at 04:04.